We hope you guys have a great trip, but the folks left behind are giving away the farm! 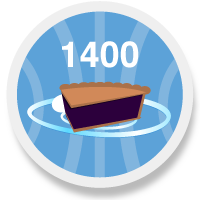 We now have Pie Upgrades that will allow you to take the maximum you invest in someone to 1400 shares using upgrades. The current More Dessert and Even More Dessert Bonuses are still active, previous Dessert Bonuses you've used will be active even with the new Pie which means you might be able to go to 1600 shares in someone.